NEW YORK (CNNfn) - You wouldn't build a house without a blueprint that outlines where the bedrooms go and how big the kitchen will be. Creating a retirement plan requires the same precise measurements - and a solid foundation. Whether you're a Gen-Xer just starting out or a baby boomer loaded with financial demands, you've got to outline your goals, set priorities, decide on an allocation plan for your investments, and keep your financial plan headed in the right direction. "Having a special strategy is critical. You can't use the shotgun approach," said Barbara Saunders, a certified financial planner (CFP) in Dallas, Texas. "You have to have a plan and it's important to stick to it, but it should be flexible too." Let's say you're 25 years old and you're just starting your career. Your� retirement plan is a blank sheet of paper, and your head is probably spinning with terms like 401(k) and IRA. Where should you start? Well, for starters you need to know that Social Security will replace only 28 to 40 percent of your income. The rest is up to you - whether it's a company plan or your own personal investments in mutual funds. Most of all, it's crucial to get started as soon as possible. Most large employers offer a 401(k) plan, which allows you to contribute pre-tax dollars up to $10,500 a year or typically 15 percent of your salary. Often, companies will match a certain percentage of your contributions, usually about 4 to 6 percent. Experts insist you should contribute at least the amount that your company is willing to match. If not, you're throwing money away. Let's say your salary is $50,000 and your company will match 50 percent of the first 6 percent of your contributions. That means that if you contribute 6 percent of your pre-tax dollars, or $3,000 in a year, your company will put in another $1,500, making your annual contribution $4,500. If you contribute less than 6 percent, you're on your own, giving up the chance to have your company contribute to your retirement plan - in this case $1,500. Once you've filled out the 401(k) paperwork and you're siphoning off regular contributions to your plan from your paycheck, how do you pick the right funds? 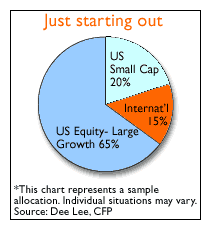 Most planners say, go for growth!� Surely, each investor has a different comfort zone for risk. But typically, the long time horizon for someone just starting out allows you to be super aggressive, which means loading up on high-voltage stock funds. Of course, aggressive growth funds tend to be more volatile and can slip into negative territory over the short-term. But remember, your retirement account is something you won't touch for another 30 years - and historically, the stock market has returned between 10 and 12 percent over the last 40 years. With that in mind, Dee Lee, a CFP and co-author of "The Complete Idiot's Guide to 401(k) Plans," suggests a portfolio 100 percent in stock funds. Avoid bonds like the plague. However, if you think you'll sleep better at night with more conservative investments, you can increase your bond fund exposure to 10 to 15 percent. For most 25 year olds, the idea of saving for retirement would be like buying life insurance. Why bother, right? You're going to live a long time and you've got more important things to do with your money right now like car payments, credit-card debt, furnishing your new apartment and, of course, student loans. But experts say there are big advantages to starting early. By giving up that caf� latte and croissant every day you can save $80 a month. Now that may not sound like a lot of money today, but if you invest that money in the market, 25 years from now your little coffee fund will be worth $146,000, assuming an average annual return of 12 percent. The reason why it's so good to start saving early is because of compound interest. That's where your investments earn interest and then you earn interest on the interest. Compound interest is so powerful that if you save $2,000 a year starting at 20 until you're 30, you'll still have more money at retirement than a person who saved the same amount between ages 30 and 60. Slow and steady investing known as dollar-cost averaging does the same thing. Dollar-cost averaging - making small, regular investments over time regardless of where the market is moving - will spread your risk. CFP Jennifer Myers says every little kernel helps and automatic deductions are the way to get there. "It may seem small, but it adds up," she said. "And when you have the compounding effect of growth in the market, you'd be surprised. "Once you've maxed out your 401(k), consider a traditional IRA where you can contribute up to $2,000 a year. You can deduct the contributions if you don't have another qualified plan like a 401(k). Once you hit your 40's things start to change a little bit, so you need to make a few adjustments to your retirement blueprint. Let's say you're married with two children now. You've been investing regularly in a� 401(k) plan and contributing to an IRA. You've also opened an education IRA for your kids. You've paid off those student loans, but now you've got new financial responsibilities. College is just around the corner. You'd like to buy a new house. A vacation every now and then would be nice and your parents are getting older and may need help. How can you keep your retirement plan in check with all these other obligations piling up? Financial pros say it's crucial to reexamine your financial plan as you get older. If your money is limited, pick a few priorities. Start with your 401(k) allocation. After all, the turbo growth funds you chose as a 25-year-old may not be appropriate now that you're closer to retirement. 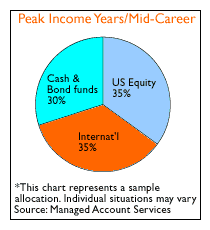 You may want to shift some money into bond funds to preserve your capital. Of course, each investor has different risk levels, so figure out how much risk you're willing to take on. Planners say it's a big mistake to borrow from your 401(k) plan or take early distributions from an IRA to pay for kids' college or other expenses. If you borrow from your 401(k), you'll lose out on stock market gains. And if you leave your job, you'll have to pay back the loan in 30 days. In general, if you withdraw from retirement plans before age 59-1/2, you will incur a 10 percent federal penalty on the investment, a state penalty, and, on traditional IRAs, applicable income taxes. After working long hours and receiving several promotions, you're now in your late 50s. You've continued to plug away at your 401(k) so take a moment to pat yourself on the back for not borrowing from it. The kids are out of college, the house is paid for, so now you can focus on preparing your portfolio for retirement. Experts say now is a good time to go back to your blueprint and make some minor changes. You'll probably want to� reallocate your 401(k) portfolio because you'll be withdrawing from it in a few years. That means increasing exposure to bond funds and more conservative investments to protect the principal. 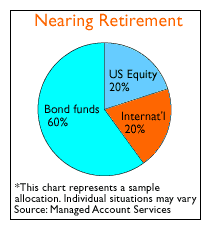 Frank Joy, a CFP in Las Vegas with First Security Bank, says some planners use the following formula to determine a 401(k) portfolio allocation: Subtract your age from 100, which tells you what percentage of your portfolio should be in equity funds. For example, if you're 60 years old, a conservative portfolio would consist of 40 percent equity funds and 60 percent bond funds. To make the allocation slightly more aggressive, Joy suggests using a base of 120, which would mean 60 percent in equities and 40 percent in bond funds for that 60-year-old investor. Years ago, retirees could live on their company pension and Social Security benefits. These days, if they don't start saving young, they simply won't be able to retire or they'll have to continue to work part-time to make ends meet. So that retirement blueprint you design and update through the ages is all the more crucial. "The thing that is critical is to develop a strategy and then make sure you stay on it," said Barbara Saunders, the Texas-based CFP. --Staff Writer Jennifer Karchmer covers news about retirement for CNNfn.com. Click here to send her email. CNNfn.com's 401(k) and IRA news! Long-term investing strategies on CNNfn.com!